I’ve got an autumn birthday myself so I don’t know the pain firsthand, but from what I remember of elementary school, summer birthday kids got a little short-shrifted when it came to celebration. Those of us with birthdays from September to June got our own day, our own batch of cupcakes, and our own rendition of “Happy Birthday to You,” and it wasn’t hard to plan weekend birthday parties, since no one’s on vacation in October. But before everyone dispersed for family vacations or camp, I remember the summer birthday kids would share one batch of cupcakes, on one afternoon, to the tune of one “Happy Birthday to You [plural].” My sympathy was not even lessened by the thought that they were guaranteed good weather or by the fact that we always had fun celebrating my sisters’ birthdays. As we’ve mentioned before, we don’t love turning on the oven in the heat. In August, birthday cakes are therefore often less involved than their winter and springtime counterparts. My summer birthday-cursed sisters Kate and Jill sometimes got the famous chocolate cake for dessert, but they sometimes requested something cooler. Such as this watermelon cake. My mom first made this dessert at some time during my childhood. 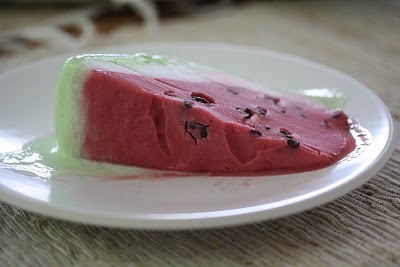 It was as awesome then as it is now, and it inspired a lifelong affection for raspberry sorbet topped with chocolate chips aka watermelon seeds. It’s simple in that it only requires four ingredients, but it is a little complicated in its technique–you’re working with melty ice cream in the heat, and that can turn things sticky. Crazily enough, Phoebe and I made this in the makeshift condo kitchen on our spring break trip to Costa Rica a few years ago, somehow serving it to twenty friends before it melted. I think it’s become harder to find green ice cream or sherbet recently. We used to buy a cheap, unbranded gallon of pastel green lime sherbet from the supermarket, but apparently health consciousness has done away with the availability of that. My mom’s friend Renee suggested using green tea ice cream, which she found at Waldbaum’s. After spending a while at the freezer case, I wound up buying three cartons of Edy’s Spumoni ice cream and fishing out the green pistachio from the strawberry and chocolate that shared the gallon. The pistachio tasted delicious, so it was all for the best. Worst case scenario, you can use vanilla–just dye it green with food coloring before using. And don’t criticize me for using fake green ice cream. This cake is worth it. Just imagine the delight of your sisters or guests when you slice into this big round green thing to find it looks just like a watermelon, and tastes even sweeter. Clear a space in your freezer that will fit the bowl you’re using. I like to turn down the freezer temperature a notch or two. 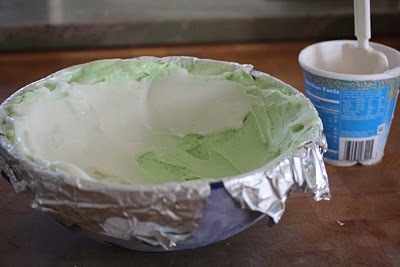 Leave the green ice cream out on the counter until it reaches an icing-like consistency. You want it to be easy to spread, but not at all liquidy. 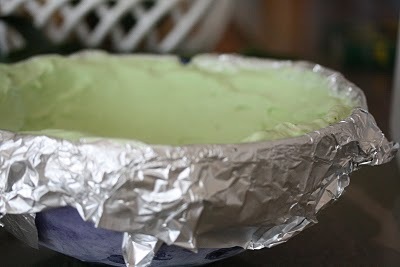 Meanwhile, cover a 10-12 cup bowl with overlapping sheets of tin foil. 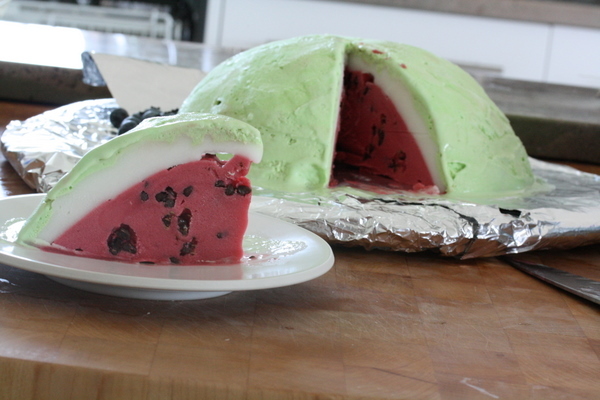 Remove the green and white watermelon cake from the freezer. 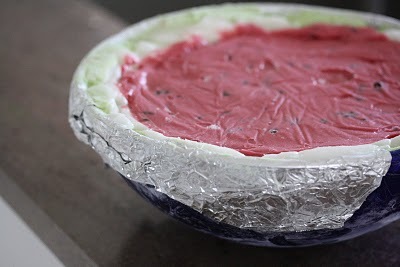 Spoon the raspberry sorbet into the cavity and smooth the top. Cover with plastic wrap, then a tight layer of tin foil.